When your teenage daughter’s group of friends can’t stay away from your new pool, you know you’ve done something right. Jaws drop when visitors first spy the deck area at Denise and Adam’s home in rural Sunshine Coast. “Every visitor to our home just says ‘Wow!’” explains Adam. 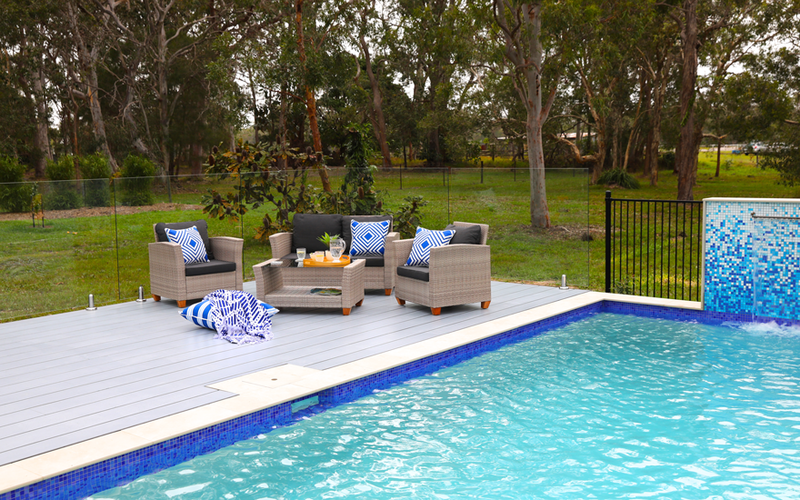 “And then they want to know more about the material as they love the look.” Here we chat with Adam and Denise about why they chose HardieDeck™ for his pool area. Rewind to the start of the process, when Adam knew he couldn’t afford to get it wrong. The couple had the challenging prospect of a deck and pool install prior to the full renovation. “This meant that the set-out for the deck had to be precise as it would impact on the extension,” he says. The lowest point of clearance between ground level and the bottom of the bearers was 150mm, so all materials needed a high level of moisture resistance and durability. With that in mind, Adam diligently researched all the options, also taking into account their rural location and sub-tropical climate. HardieDeck by James Hardie is made of premium fibre cement so it won’t rot due to moisture, it won’t splinter or warp in the sun, and is suitable for BAL (Bush Attack Level) FZ, the most extreme bushfire level. And if you’ve ever experienced ‘spongy deck syndrome’, you needn’t fear - its cement composition ensures you won’t feel that on a HardieDeck. "We needed a rot and decay resistant product for use close to the ground that could tolerate pool-side conditions,” says Adam. Aesthetics were high on the agenda too, and while timber boards have the look they were after, their appeal is short-lived and maintenance tedious. Once Denise had seen enough inspirational imagery on the HardieDeck brochures, they were both hooked on the contemporary lift such a decking would provide for their renovation. Solid colours provide a clean, modern look and durable sealers can be tinted in a range of hues, with greys being the most on-trend at the moment. When choosing HardieDeck floors, the sealer and finish are as integral as the colour itself. Adam and Denise were 'hooked' on the modern look of HardieDeck. As well as being adaptable to any style of home, HardieDeck provides a seamless overall look and you can easily integrate face-boards for edging so as to conceal bearers and so on. The final look of the deck reflects its relative ease of installation, another factor that appealed to Adam. “I researched the install process extensively and it seemed faster and more efficient than conventional decking systems and techniques. This turned out to be very true.” This even when fixing down to a pre-fab floor frame of steel, which is typically a slower process. The wide slat design, he says, also helped to reduce installation hours, labour costs - and even the number of screws needed! 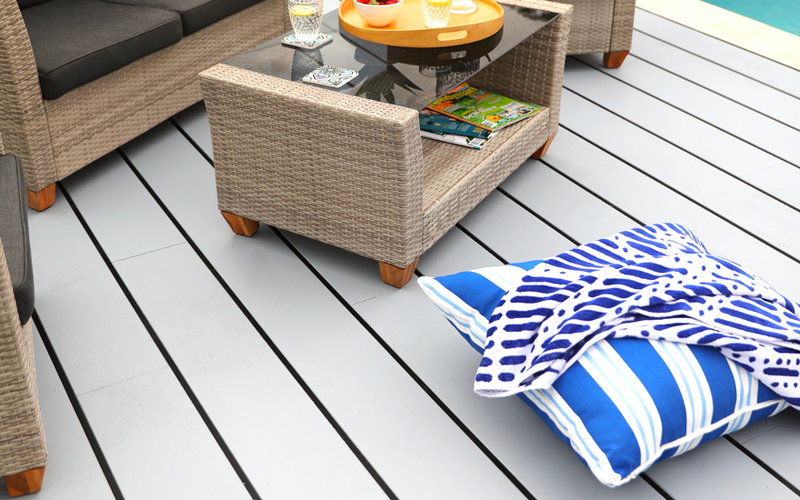 HardieDeck is resistant to moisture damage, making it perfect for pool areas. 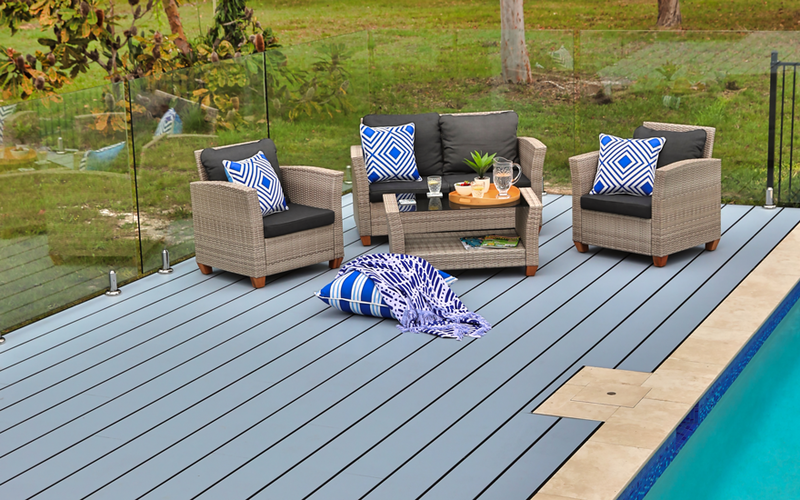 The ideal floor for around pools and spas, hardy for uncovered areas in tropical, subtropical and Mediterranean climates - and stylish to boot - HardieDeck is the ultimate decking option for the Australian family lifestyle.